Can Your Teeth Cause Headaches? Chronic head pain can be extremely debilitating, especially when the cause remains unknown. When discussing headaches and migraines with your doctor, the important role your teeth play in your level of comfort is often overlooked. All it takes is one minor imbalance to create a huge array of complications. If you are a chronic sufferer, it may be time to talk to your dentist about how your teeth and oral health may be impacting your search for headache relief. True or False: Bruxism is a main contributor to chronic headache pain. True or False: Malocclusion can cause headaches and jaw pain. 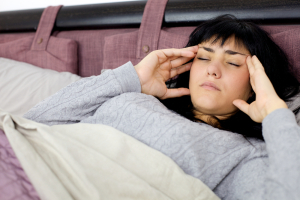 True or False: Headaches are the only symptom associated with TMJ Disorder. 1. Grinding and clenching your teeth for extended periods of time, especially at night, can cause you to experience chronic headaches, migraines, jaw pain, and tooth sensitivity. Bruxism is often overlooked when it comes to searching for a headache remedy. This is largely due to the fact that dentists are the only medical professionals trained to diagnose and treat disorders of the mouth. 2. Malocclusion does, in fact, cause headaches, jaw pain, and other types of discomfort involving your head and neck. When your teeth do not line up properly, you may have imbalanced forces being applied to your bite surface and jaw joints. This can cause strain and muscle fatigue, which ultimately can lead to headaches. 3. TMJ Disorder actually has many symptoms. Common ones include headaches, migraines, popping or clicking jaw sounds, inability to open mouth, pain, swelling, and sensitivity. Other oral problems, like bruxism, are also commonly associated with TMJ disorder. 4. Fortunately, there are several treatment options available for dental headaches. Depending on the exact cause and severity of your discomfort, you may need minor restorative dental work, occasional oral appliance therapy, stress reduction techniques, or other types of headache therapy.